The bear is a dangerous animal, I assure you, he’s the most dangerous of all! Don’t be fooled by Winnie the Pooh, Teddy Bear or Baloo, each of whom appear to be nice. It’s only propaganda! If one day, you face a bear in Canada or get stuck in a cage with one, you won’t see a cute animal, but a deadly one. And the worst bear of all lies in the forest, waiting for Davy. He observed our trapper since he left home, and will do everything he can to stop it. The bear puts on one of the best helmets from his private collection and goes out of his cave to greet Davy. How can Davy kill this ultimate enemy? He tried all of his weapons, and none worked. “I know!”, said Davy, “I have to purchase a nuclear missiles on the internet!”. But we’re deep in the forest, and there’s no internet here… Davy’ll have to find another way. Why not this baseball bat, signed by Babe Ruth himself? Davy crushes the bat with all his strength on the bear. Nothing happens. The bear laughs and hides again. “There’s no way I can kill it”, Davy said. He kicks a tree in frustration and a hive falls from it. “There’s my weapon!”. 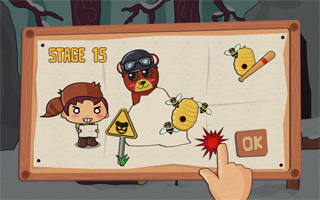 Davy kicks the tree again and hits the hive with precision so it strikes the bear violently. The bear is finally hurt, his helmet has fallen and bees attacks him from every side. Now you can finish him! 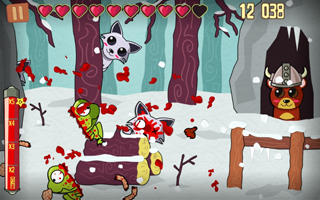 And it’s done, Davy faced all the forest animals, and survived their attacks. But what’s gonna happen now? 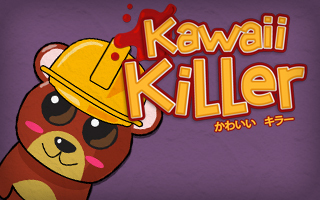 You’ll have to find out by taking control of Davy in Kawaii Killer’s forest!